For those who say driving rates will pick right back up again when the economy’s really humming, here’s something to chew on: In a report released this morning, “Moving Off the Road,” U.S. PIRG presents further evidence that unemployment rates and driving rates have changed independently of each other. Transportation reformers have made the case that there are multiple reasons behind the dip in driving rates, and that many of these factors will continue to have an impact long after this economic slump is over. If the change is in fact a lasting one, it signals that conventional forecasts of escalating traffic are wrong, strengthening the case for overhauling car-centric transportation policies in favor of transit, biking, walking, and more efficient land use. Today’s report from U.S. PIRG builds on their previous, groundbreaking research showing that young people are leading the reduction in driving rates and that the Driving Boom has decisively ended. These findings have become common knowledge, frequently referenced by top federal officials, members of Congress, and even international credit rating agencies. The PIRG report compares changes in driving and joblessness in all 50 states from 2005 to 2011. 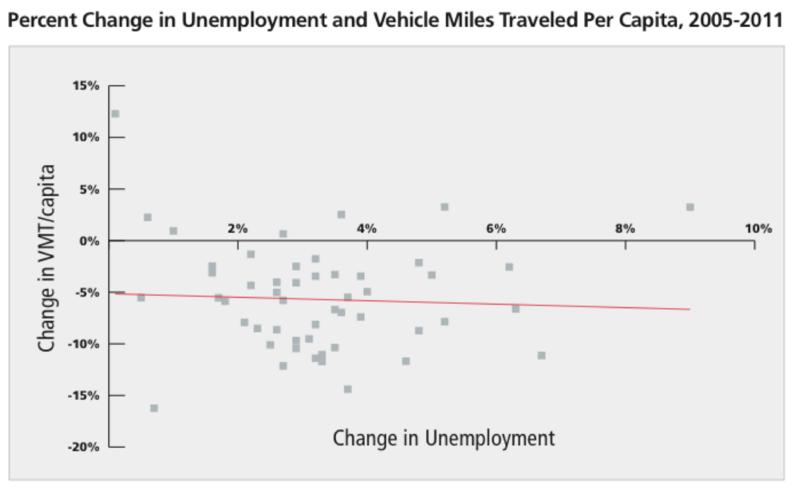 The authors call it “a useful natural experiment to examine different factors behind America’s reduction in driving,” and it provides ample evidence that unemployment doesn’t explain the drop in VMT. If the Americans were driving less because jobs are scarcer, for instance, it would stand to reason that the states hardest hit by unemployment would be those with the biggest drops in VMT. But that’s simply not true. 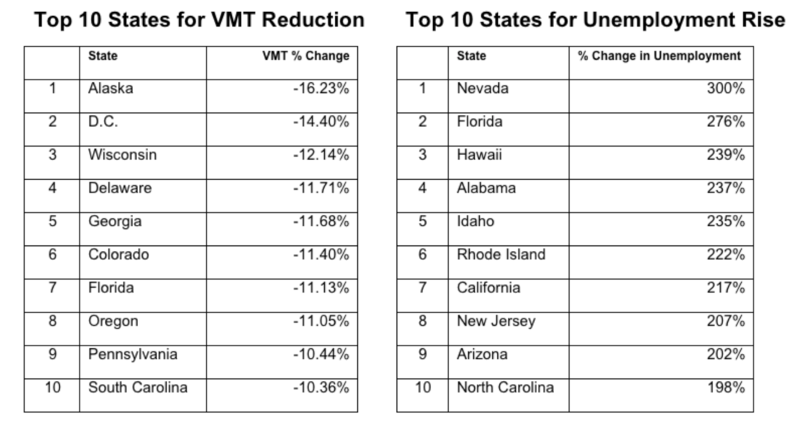 And the number one state for VMT drop? Alaska, which has reduced its mileage by a whopping 16.23 percent since 2005. So Alaska must be suffering with staggering unemployment, right? Not so. Every state in the union experienced some growth in unemployment, but in Alaska it was just a 10 percent increase — from 6.9 to 7.6 percent. One state is an outlier on both fronts: North Dakota, which has seen a massive surge in energy development. VMT hasn’t just risen in North Dakota since 2005, when it started dropping everywhere else — it’s soared. VMT there has grown by 12.29 percent — nearly four times the growth rate of the next-place state. Even North Dakota’s jobless rate has risen — but only by 3 percent. It still has the lowest unemployment rate in the nation. Report author Phineas Baxandall of U.S. PIRG even turned the employment numbers around to see if they matched the dip in driving better if you counted “declines in the employed share of their working-age population,” a slightly different way to measure joblessness. But no dice: Among the 23 states in which driving miles per person declined faster than the national average, only 11 saw faster-than-average declines in the employed share of their working-age population. And among the 10 states with the greatest reductions in the employed share of population, only two were also among the 10 states with the largest reductions of driving. But the economic slump and joblessness simply can’t explain the large and enduring drop in driving rates. Baxandall has explored some other possible factors in previous reports: the way that technology has replaced the need for some trips; the growing preference for walking, biking and transit instead of driving, especially among young people; the rising price of gas. So Then It Must Be About Urbanization or Telework, Right? Still, the mysterious lack of correlation between urbanization and driving might be explained by the fact that “the more important population shifts are not between rural and non-rural areas but between suburbs and more densely populated cities.” Continued migration from suburbs into cities could well continue to reduce driving rates. Another logical factor in the driving decline is the rise of telework. More and more jobs can be done remotely, and 9.5 percent of all workers say they work from home at least one day a week. But Baxandall says those people may not have to drive to work, but they’re finding ways to fill in those miles. But a majority of miles driven are for non-commuting purposes. And it’s the non-work driving that has seen the sharpest reduction. People have reduced their travel for family and personal errands twice as much as they’ve reduced their work travel. They’re driving less for social and recreational reasons, too. The reduction in driving to and from work was actually less than 16 percent of the total reduction in miles driven. Still, the drop in driving has been dramatic. 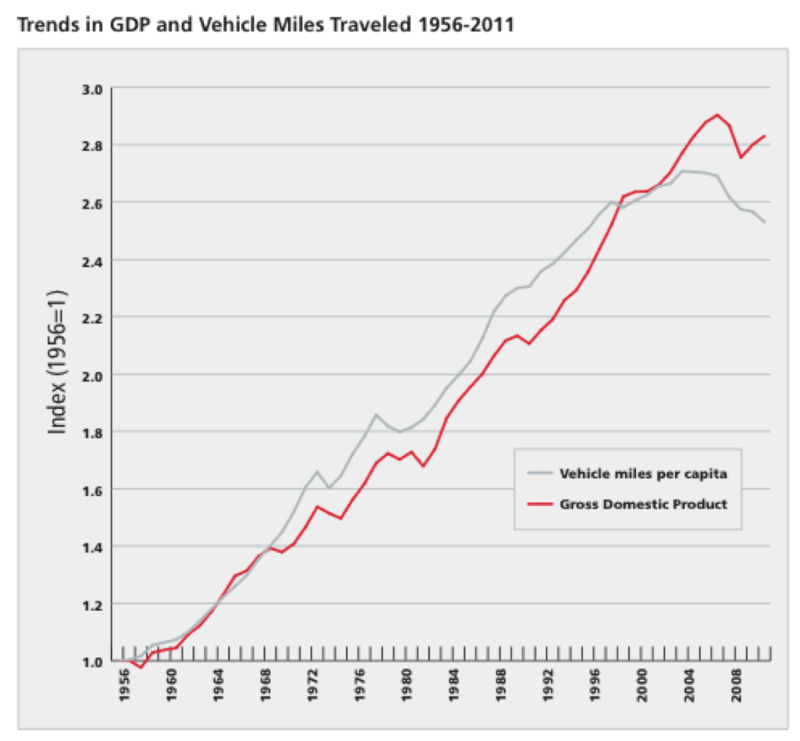 Nationally, per-capita VMT peaked in 2004 and had fallen 7.4 percent by the end of 2012. And the trend is particularly pronounced among the young, the famous Millennial generation that’s got everyone scratching their heads. Average driving miles for Americans aged 16 to 34 fell by 23 percent between 2001 and 2009. Another reason we can be sure that these trends aren’t mainly a product of the recession is that they began before the recession. Per-capita driving peaked in 2004 — three years before the start of the recession. The number of vehicles per person also peaked before the recession. And they haven’t bounced back since the recession technically ended in June 2009. And Gross Domestic Product and driving rates, which have tracked closely together for decades, have “uncoupled,” as you can see in the image above. There are a combination of reasons for the decline in driving, and it’s still unclear just how much weight each one has. U.S. PIRG has done an excellent job showing that the changes in travel behavior can’t simply be chalked up to any one factor, even something as seismic as the Great Recession. One way or another, Baxandall says, “policy makers can stop wondering whether American driving trends are changing” — and they should start changing transportation policy in accordance with people’s changing behavior. “Correctly identifying a long-term plateau or reduction in driving would provide enormous opportunities to avoid waste and invest in the future,” he writes. Georgia is a real surprise. Could this be driven by Wal-Mart, where people just drive to the SuperCenter instead of doing lots of trips to smaller stores? New graduated and delayed licensing laws for teen drivers I’d imagine contributes a lot to the 16-34 age group drop as well as the story-cited cultural factors. unemployment does and doesnt have a contribution to the decline in driving rates. while there may be some related links to lower driving due to the lost of jobs, there have been a shift to other ways to get around for about 10 years already. its also that every major city has so much different variance in how to get around, be it more bicycles, more trains, distance, that its hard to pinpoint unemployment and driving rates being on the same scale. sure unemployment brings down some driving, but i think the overall shift of less usage due to other found means is a equally contributing factor. What about the gas price ? Is there a correlation with it? The massive failure of malls is also both a resulting and a predictive indicator. The challenge now is to change the CEQR MANUAL, the city planning assumptions used by all transpo consultants to fulfill the ULURP and Environment Impact statement required for new developments. this can be said for books which i only buy kindle versions now and lots of other things. That NPR link has quite a lineup of comments, among the points of view are: “Detroit” doesn’t have a clue about the real world of the “Millennials”. Many of them don’t expect to ever buy a new car. Stop trying to sell “bells and whistles” and make a good, reliable, user-friendly car. One group does have cars and SUVs, but they’re all from a pre-I-phone era. One correspondent criticized the auto industry for trying to “pander” to their perceived notions of what “millennials” want. Just for the record, I’m a senior citizen who remembers when automatic transmissions were the latest development. Since 2001, I’ve had a Honda Accord LX, which now has 138,000 miles on it. My only “frills” are electric window controls, which became handy when my workplace started using card-reader gates at the entrance, and a CD player in the (quite user-friendly) audio system. “And it’s the non-work driving that has seen the sharpest reduction. This means it really is taste. People just don’t want to drive as much. Perhaps this is because you can’t do anything while driving, and everyone is on their phones all the time; perhaps it’s for some other reason. But if the sharpest reduction is in social, recreational, family, and errands, then that’s a preference to not drive. Is it really $4 gas that stopped you from going to Walmart? Not the horrendous retail experience, the long check out line and the inconvenience of driving? you’ll download the movies in half the driving time and then you dont have the clutter of the hard copy. People do play with their devices on the bus a lot down here. The Tri County Link bus service has free on board WI-FI now. Those people way out in the country really do like their tablets. Walmart is our busiest bus stop in Mount Pleasant now. Over 100 employees ride the bus, which stops at the front door of the Garden Dpt. (where there is a bench to wait and a place to get out of the cold and wind when the weather is bad. Some people do use the bus to shop there as well. I’m not a big fan of Walmart. When I did transit outreach, the Manager, a very perceptive man, figured out that I never shopped there. Fortunatly we were able to move on to more productive areas of dialogue.